UARTs cable with SUBD9 plug for FFUART and BTUART with integrated RS232 level adapter (all signals), STUART signals on free wires with power supply. Molex KK® power supply plug. 2 receptacle housings (Harwin M40-1201500) with 20 pre-crimped contacts (Harwin M40-9000099, single ended) to build wire-to-board connections for X13 (GPIOs) and X14 (Analog signals and miscellaneous). 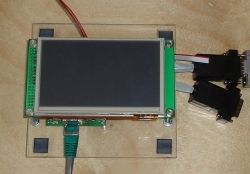 More details about this LCD here. 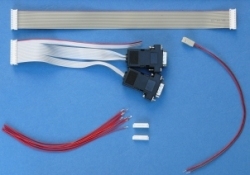 Wiring kit for XScale boards. 1 receptacle housing (Harwin M40-1201500) with 10 pre-crimped contacts (Harwin M40-9000099) for X13 or X14 connectors. FFC cable - 0,5mm pitch - 30 conductors - 50mm (2") long. FFC cable - 0,5mm pitch - 30 conductors - 100mm (4") long. FFC cable - 0,5mm pitch - 30 conductors - 150mm (6") long. FFC cable - 0,5mm pitch - 30 conductors - 200mm (8") long. 5 connectors FCI 10051922-3010ELF for FFC0530 cables. M12x0.5 standard lens with infrared cut filter, 2.1mm focal length. Wide field of view: "fisheye" lens. M12x0.5 standard lens with infrared cut filter, 6mm focal length. M12x0.5 megapixel lens without infrared cut filter, 6mm focal length.